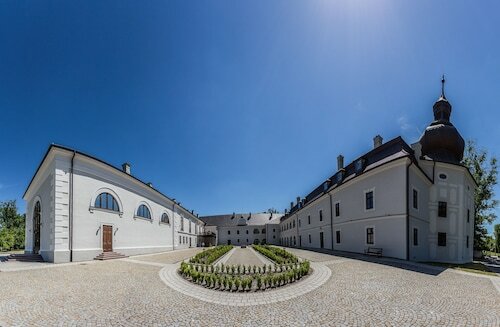 Situated in Oponice, this hotel is 8.8 mi (14.1 km) from Topolcany Church and 10.3 mi (16.5 km) from Tovarnicky Park. Nitra Synagogue and Pribinovo Namestie are also within 16 mi (25 km). Situated in Prievidza, this pension is within 1 mi (2 km) of Museum of Prehistoric Slovakia, ZOO Bojnice, and Bojnice Castle. Kľak and Topolcany Church are also within 32 mi (52 km). Prievidza Station is 18 minutes by foot. Located in the heart of Topolcany, this hotel is 0.2 mi (0.4 km) from Topolcany Church and 1.3 mi (2.1 km) from Tovarnicky Park. Topolcany Castle is 10.3 mi (16.5 km) away. Topolcany Station is 11 minutes by foot. 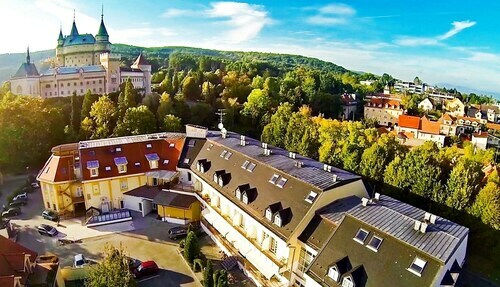 Situated in Bojnice, this hotel is within a 10-minute walk of Bojnice Castle, Museum of Prehistoric Slovakia, and ZOO Bojnice. Kľak and Topolcany Church are also within 32 mi (52 km). You won't find any accommodation in the centre of Partizanske. There's just 1 hotel within 10 kilometres, so you should hurry! Get in soon and book a room at the Penzión Stará pumpa. It's the only listed option close to the main hotspots. For some alternatives, look at the Best Western Plus Hotel Belassi and the Penzion Maxim. They are located 25 kilometres and 25 kilometres respectively from the main center. If these aren't the best fit, you can try the Hotel Preuge or the Hotel Pod Zámkom. If you'd like to experience some nearby cities, consider Topolcany and Trencianske Teplice. Journey 17 kilometres to the southwest of Partizanske and you'll discover Topolcany. That said, Trencianske Teplice is 35 kilometres to the northwest. 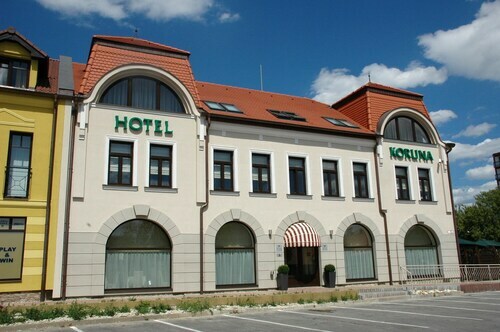 Hotels in Topolcany are the Hotel Koruna and Hotel Puk. The Hotel Dynamic and Hotel Panorama are some of the better ones in Trencianske Teplice. If you enjoy sports and want to watch local games, you might choose to visit Stadium of Anton Malatinsy, which is located to the southwest of Partizanske. The Holiday Inn Trnava and the Hotel Spectrum are both top options if you hope to hit the hay close by. M.R.Stefanika Airport is the nearest preferred airport for arriving in Partizanske and is 100 kilometres drive from the centre of town. If you would like to stay nearby, try the Hotel BNC or the NH Bratislava Gate One. How Much is a Hotel Room in Partizanske? Hotels in Partizanske start at AU$124 per night. Prices and availability subject to change. Additional terms may apply.